Most pasta sauces can be made in the time it takes for a big pot of cold water to come to a boil. Some take much longer, and in learning to know the difference there may be some moments of disappointment and of hunger (or at least satisfaction delayed). Pork should be the meat in it because, as my friend’s mother says, “Pork just tastes better.” Or, as my other friend says, “Chicken has become the default cheap meat, but it really ought to be pork. Pork already is what we think chicken should be. 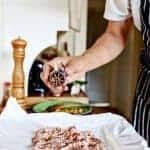 Pork is more chicken than chicken.” She’s probably right, but what I love about ground pork for a pasta sauce is its sweet, rich flavor and its ability to quickly cook to tenderness. The sauce I came up with can, in fact, cook in the 30 or so minutes it takes to boil the water and cook the pasta, but it’s a bit better if there’s time to simmer longer. Put a big pot of cold water on to boil. Add salt. 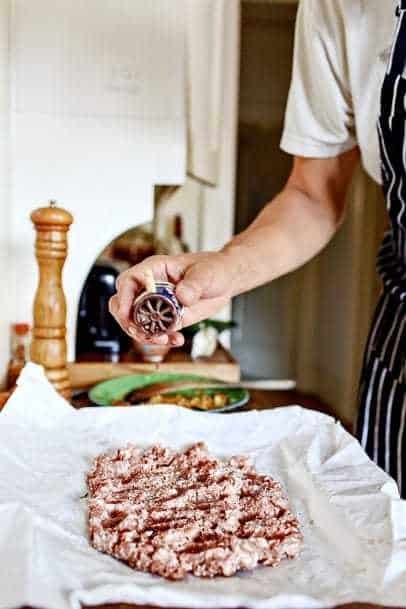 Spread out the ground pork like a hilly landscape on the paper it was wrapped in, or on a plate, sprinkle with ½ teaspoon salt, and grind on some black pepper. If desired, for a more sausage-y effect, sprinkle with red pepper flakes and toasted and ground fennel and coriander seeds. Spreading the meat out like this shows more surface area to the seasonings and requires less handling to mix it in. Overhandling ground meat can make it turn tough, so don’t. Fold up the patty of pork and mix it just until the spices are well distributed. Of course, if you’re using sausage, then skip these seasoning steps. Heat a large skillet over medium-high heat. Add 1 tablespoon of the oil and then quickly add the pork, breaking it into chunks and placing it in the hot pan bit by bit. Tilt the pan to spread the oil around and nudge the pork around to fill in the gaps and get even browning, but don’t move it around too much. The skillet should be at full-throated sizzle—if it’s too quiet, turn up the heat. Resist the temptation to poke and stir at this point; just let the meat fry: it will go from pink to gray and, if you stay out of its way, to a nice caramel brown, which looks and tastes much better, sweeter. When the first side is ready, turn the pieces over and brown the other side. Set the pork aside on a plate and tip out some of the grease if it makes you feel better, though I generally find myself adding it back in later. Add the remaining tablespoon of oil, if needed, and the onion. Sprinkle with salt and stir with a wooden spoon to scrape up the bits of browned meat as the onion begins to get juicy. Lower the heat to medium and cook the onion, stirring occasionally, until very tender, about 15 minutes. Add the parsley, garlic and red pepper flakes and stir for a minute as the garlic sizzles, but don’t let it get even a little bit browned. When the garlic smells really good, add the tomatoes and the pork. Use the back of the spoon on any chunks that are too big, and adjust the heat so that the sauce is simmering but not bubbling fast. At this point, you can cook the pasta in the salted, boiling water, stirring frequently, and the sauce will be done in the 10 or so minutes it takes to cook, though it will get better if given another 10 for the pork and tomatoes to enjoin. If the pan starts to dry out and sizzle, add some of the juice from the tomatoes or, if you’ve used all the juice, a little water. Chicken or pork stock works very well also, but water is fine. Taste the pasta, and when it is done, drain and add it to the sauce, and toss, stir and toss. Taste it; you may want to add some salt, oil or the pork fat you set aside—or a splash of the pasta water if it needs more flow. Serve hot and pass the cheese to grate. The final step is a very important one: tasting and correcting the flavor and particularly the texture, which is key to making really great plates of pasta instead of noodles that just happened to arrive at the table sharing space with the sauce. Once you’ve drained the pasta (saving some of the water) and mixed it with the sauce in the pan, twirl in a fork and take a bite. Think about saltiness and spiciness, also acidity, but don’t forget to notice the consistency of the sauce and how it clings to the pasta. Move some of the pasta aside and look at the bottom of the pan. There should be a little liquid there, a little juiciness. The olive oil and the starchy pasta water will combine to give the sauce a shiny, slightly thickened quality that sticks to the pasta. If yours looks too watery, turn up the heat and stir it around for a minute to evaporate some of the liquid. If too dry, add a splash of the pasta water and stir well. A last shot of olive oil is often very in order. Reprinted with permission from 12 Recipes by Cal Peternell (Morrow Cookbooks, Harper Collins Publishers, © 2014).